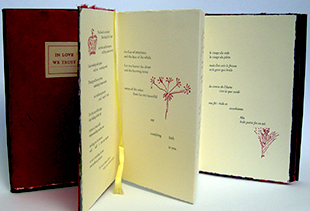 Julie Baugnet: "My books explore the common territories of poetry and image. Using color, texture, and the written word, I weave landscape and voice. 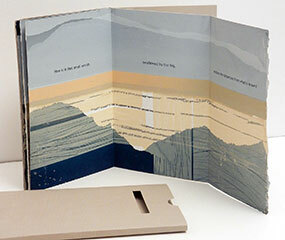 I create small edition books using paint, mixed media, letterpress, handwriting, and screen-print techniques. I collaborate with many poets, both national and international. Many of my books are bilingual—adding an element of cultural exchange. The materiality and physical presence of the book intrigues me. I work in large and small formats. " St. Paul, Minnesota: Julie Baugnet, 2017. Edition of 10. 5.75" x 8.5" (closed). Typography is Trebuchet. Nine pages, traditional codex except for a 3-page foldout at the end. 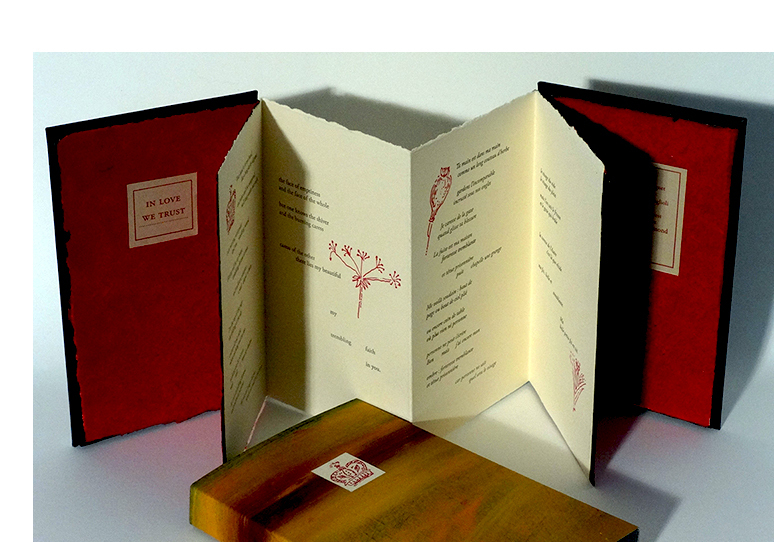 Screen printed text and image on Rives BFK paper. Signed and numbered by the artist and poet. Housed in a die cut wrapper made from French Speckletone paper. Julie Baugnet: "How is it that small worlds, swallowed by the big, endure the departure from what is known? This last sentence of the poem intrigued me. I set out to create a very sparse book, but ended up using many transparent layers to create a sense of mystery and wonder. If these birds can find their way through their long migratory route, then I can too. I'm done with GPS, I want to follow my instincts. This is also what the creative process is about. There is no road map — we just begin." St. Paul, Minnesota: Julie Baugnet, 2015. 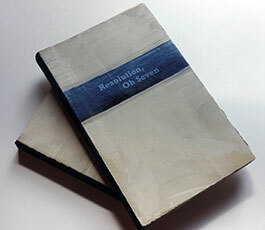 Edition of 7. 5.25" x 8.5" 13 pages. Type is screen printed in Minion Pro on Rives BFK. Introduction screen printed in Myriad. 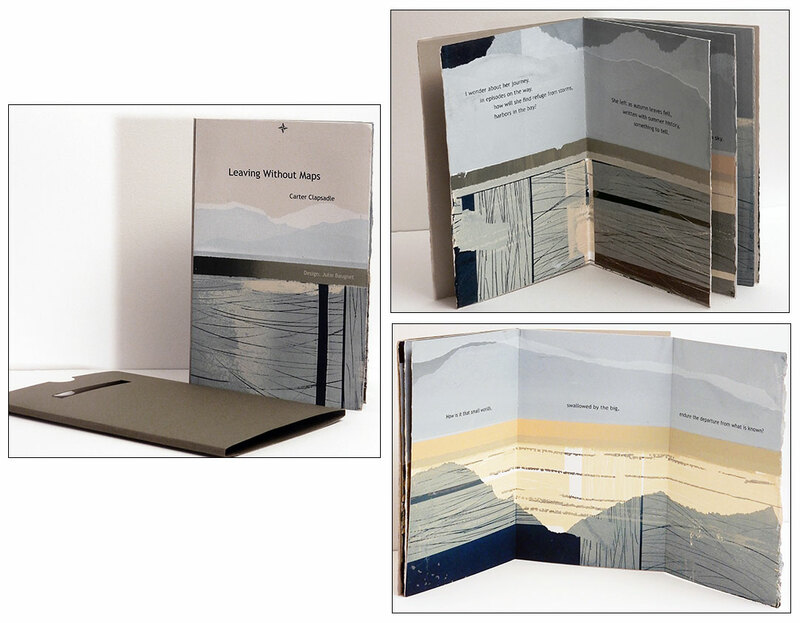 Housed in a soft-cover slipcase. Signed, dated, numbered by the artist and poet. Julie Baugnet: "The animated river image is built up of many transparent layers, the repetition creates a moving effect as the image bleeds off the page. Clapsadle writes an eloquent poem about his elderly neighbor who has been a great inspiration to him. Carter Clapsadle, Introduction: "This poem was written for my neighbor, Lucile Kane, who resided for many years in St. Paul, MN. She was the curator of the Minnesota Historical Society's manuscript collection and wrote the book, The Waterfall That Built a City — an historical account of the Falls of St. Anthony. Her book records the only major waterfall in Minneapolis on the Mississippi River. 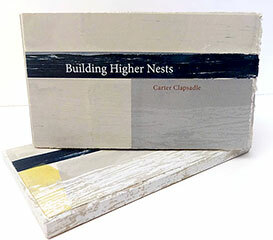 The poem takes place during spring when the Mississippi Flyway brings in migrating birds from the delta." St. Paul, Minnesota: Julie Baugnet, 2015. Edition of 5. 5.5 x 9" closed, extends to 88"; 16 pages. Accordion structure. Screen printed in Rockwell bold 30/32 on Rives BFK. Mediums: graphite, color pencil, acrylic, and ink. In slipcase. Signed, dated, numbered by the artist and poet. Colophon: "Asked once too many times about new year resolutions and goals, Carter challenged the traditional list of promises for 2007." St. Paul, Minnesota: Julie Baugnet, 2009. One-of-a-Kind. 6 x 7.25" closed, 23.5 x 7.25" opened; 4 pages. Double-sided accordion. Oil on paper with pressure prints. Slipped into illustrated matching vertical case. Julie Baugnet and Felip Costaglioli, both professors at St. Cloud State University, she in Design and he in International Cinema and Aesthetics, have collaborated on several artists' books (see Through the Window and Trees, both 2007). Here they are joined by Lin Lacy, Lin Lacy a fiber artist, who studied design at Reitveld Academie in Amsterdam, Holland. 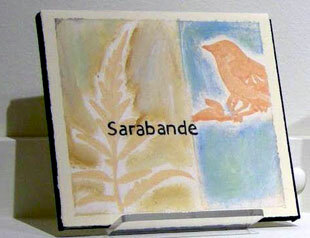 Julie Baugnet: "Sarabande— traditionally meaning a stately court dance in slow triple time, was the inspiration for this poem. Felip uses meter as his foundation for writing poetry, and here you will find the rhythm of 6 syllables for the first stanza, then another 6, then 7, and then 3, then 6 and 6. So this is a modern poem with the idea of meter if one is inclined to break down the syllables. This way of working was important for many French poets of the 18th and 19th centuries. gives a dream-like quality, it is magical-realism; a narrative technique that blurs the distinction between fantasy and reality. It’s hard to translate, and I would say that it is like 'love' itself." St. Paul, Minnesota: Julie Baugnet, 2014. Edition of 7. 4.375 x 7.5" closed, extends to 17 x 7.5"; 4 pages. Accordion structure. Bilingual text: English and French. Letterpress printed by Super Session Press. Adobe Garamond typography. Paper title on front pastedown. Colophon on back pastedown. Bound in painted boards of oil on Rives BFK. Slipped into painted case. Signed by both artists on the colophon. Numbered and dated. 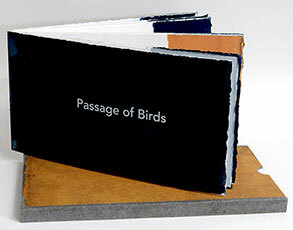 The poem's title captures the essence if not the total experience of this artists' book. It is "at once trembling fortress / and stubborn prisoner" like the lover-speaker of the poem. St. Paul, Minnesota: Julie Baugnet, 2015. Edition of 3. 6 x 11.25"; 16 pages including pastedowns. Screen printed in Avenir medium on Rives BFK. In slipcase. Signed, dated, numbered by the artist and poet. Colophon: "This poem came about after experiencing the Sandhill Crane migration on Nebraska's Platte River. 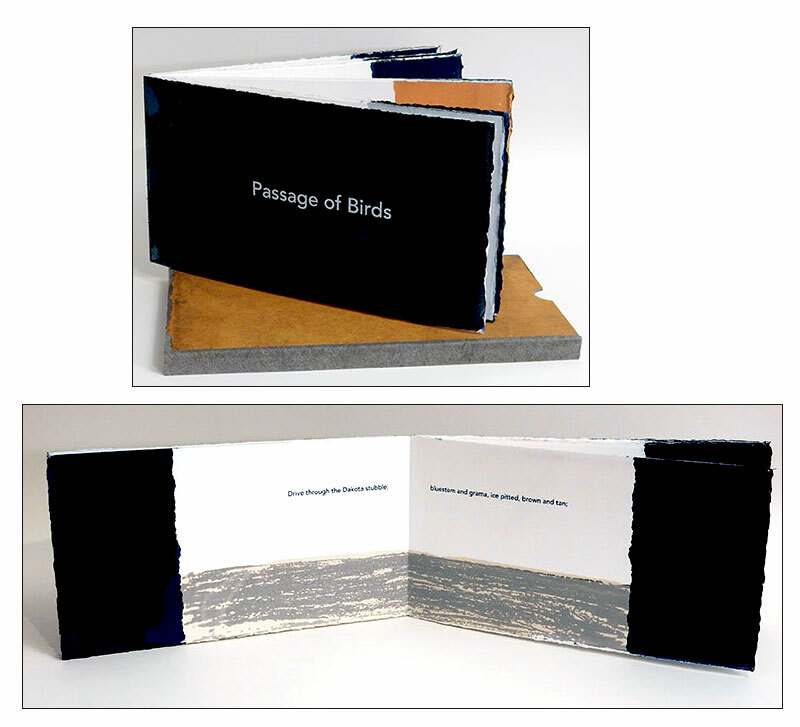 … Passage of Birds was created while in residence at Minnesota Center for Book Arts summer of 2015."